All too often when we think of leadership we visualize a single person, an individual. Unfortunately, this can be dangerous and more so in an environment that demands change. Human nature searches for heroes and scapegoats, many times in the same person. However, when we recognize leadership as an activity rather than as a role, we come closer to appreciating that it may require more of us to be engaged. This is especially true where the challenges encountered are complex and adaptive rather than simple technical ones. The New York Times Magazine for Sunday January 18, 2009 is a special inauguration issue which was basically handed over to photographer Nadav Kander for portraits of President-elect Barack Obama’s “People.” Since we’ll all be his “People” in a few days, I think the issue would have been more appropriately titled “Obama’s Team.” In any case, I enjoyed it for a few reasons. First, maybe it’s just me, but I really like to know what people look like. I can’t really explain it other than it’s comforting to be able to connect a face with a name, even if I never meet any of these people and will only be reading about them in the paper or watching them on television. Second, I’m a big art fan and avid photographer. I believe that talented photographers can capture the spirit and essence of a person more effectively than words and for me Kander has accomplished more than thousand word profiles ever could. While this all might sound a bit superficial, and it probably is, I found something comforting and reassuring looking through the NY Times Sunday Magazine this morning. I’ve read and watched enough over the past year; now it’s time for action. These portraits paint a picture of our nation’s “leadership” starting on Tuesday. Presented in this way humanizes the concept of leadership and in them I found a strange combination of vulnerability and accountability. I couldn’t help thinking that these are some of the “People” who are stepping up to try to make a difference. But in reality, the balance of the heavy lifting is up to all of Obama’s “People” including us. (If you’re reading this, that means you!) That’s the way leadership works; it’s simply not a spectator sport. 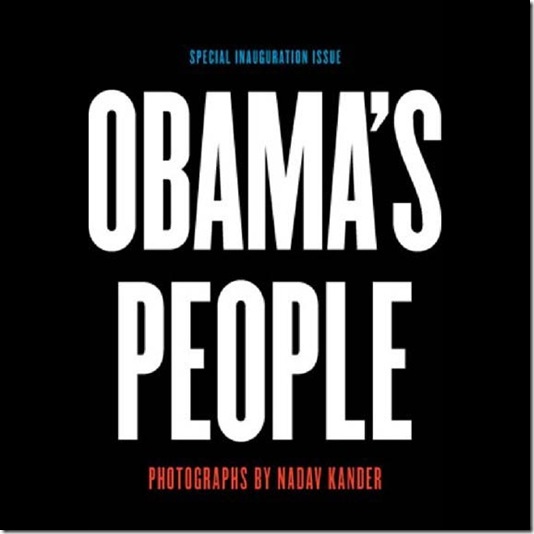 Please visit the NY Times Magazine and view the Obama People slideshow and back story. Posted in Opinion, Politics + Government. Tagged with New York Times, President Barack Obama. Peter-thank you for directing this my way. Great format for the style of the new regime. Photography is excellant. Again it's the style of both the photos and the bites of information,consistant. Formal but informal. So much can be seen in just one shot.